Inclusions: Private transportation, service of English speaking driving guide, tolls, parking, taxes. Closing: Catacombs of San Callixtus closed on Wednesdays; San Sebastiano Catacombs closed Sundays. The city of Rome is quite big. This private Rome tour allows you to see numerous sites easily. 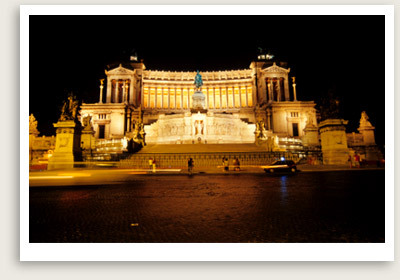 It’s a great Rome sightseeing tour for families traveling with children or the elderly. In this private Rome tour you will embark on a driving tour of some of Rome’s most important sights of this ancient city: Piazza Venezia, Marcellus Theatre, Aventine Hill, San Sebastiano Gate, Massenzio Circus, Mausoleum of Cecilia Metella. This private Rome tour will first take you on the first tract of Ancient Appian Way as far as Casal Rotondo Mausoleum. One of the highlight of this private Rome tour is a 45-minute guided tour of the Catacombs of either San Callixtus or San Sebastiano or St. Sebastian(depending on the day; see above note). The “Callixtian Complex” spans nearly 90 acres, half of which are occupied by the famous catacombs. The multi-level galleries are 12 miles long; the tombs number as many as 500,000. The Catacombs of St. Callixtus, dating from the 2nd century AD, are the most important of Rome’s sixty catacombs. They are sometimes considered the archives of the early Christian church as the tombs illustrate the beliefs and customs of the early Christians. As a beacon, Callixtus was charged with providing a tomb for each Christian, slaves included, so that all would have a worthy burial. Once Callixtus was elected pope, he enlarged the catacombs, which became the official cemetery of the Church of Rome. The Catacombs of St. Sebastian in Rome is also a fascinating place to visit. From the reign of Valerian to that of Constantine, the bodies of Saints Peter and Paul were hidden in these catacombs. The basilica was built in the 4th century, where the tomb of St. Sebastian is now found. The miles of tunnels and mausoleums are lined with mosaics and graffiti, along with many other pagan and Christian objects from throughout the centuries. Inquire about our other private Rome tours, all customizable to include what you need.